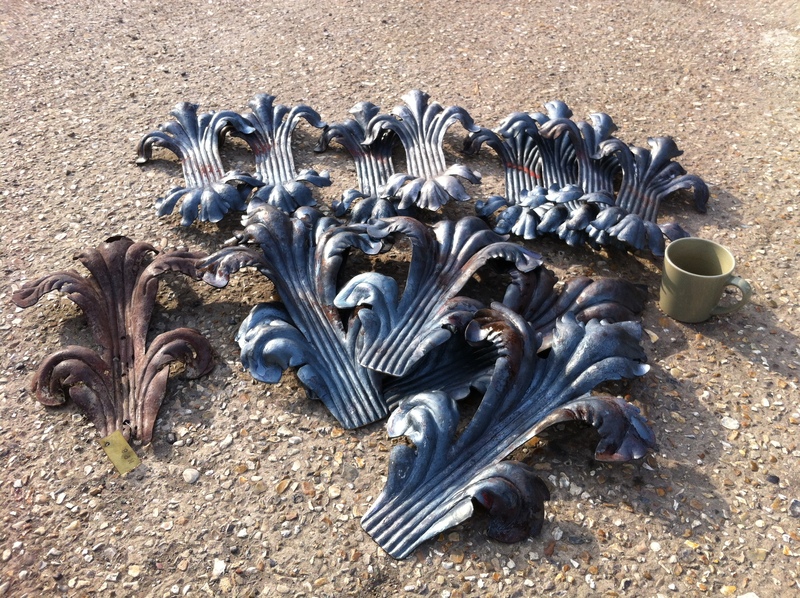 Large gate acanthus leaves in the raw, last ones! Last leaves made! Well here’s the beginning of the end, the last of all the new leaves have been offered up and painted ready for fitting later this week. The last of the repairs were completed a few weeks ago. The crane’s been booked to fit the Overthrow mid August, as have the scaffolders and labour to dismantle our site at Petworth House. 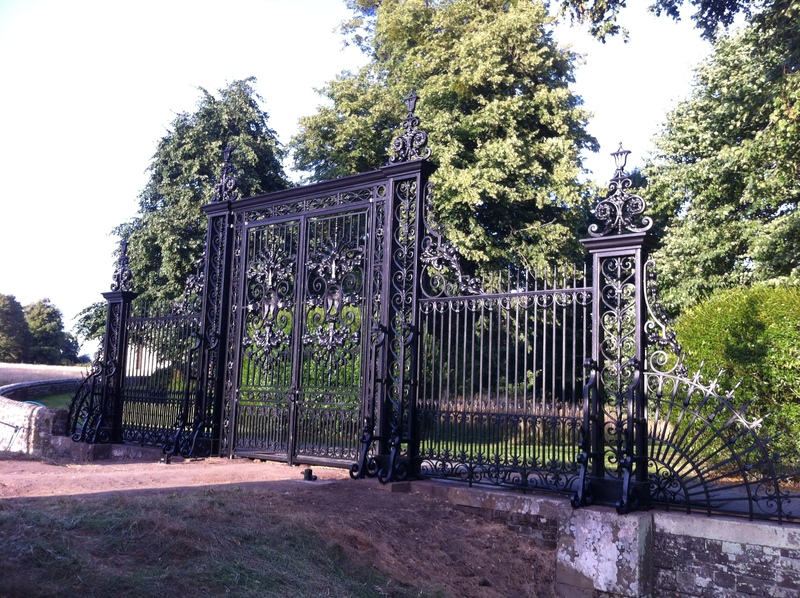 The Tijou Gates are painted in their final colour and the last leaves are being fitted as I type. 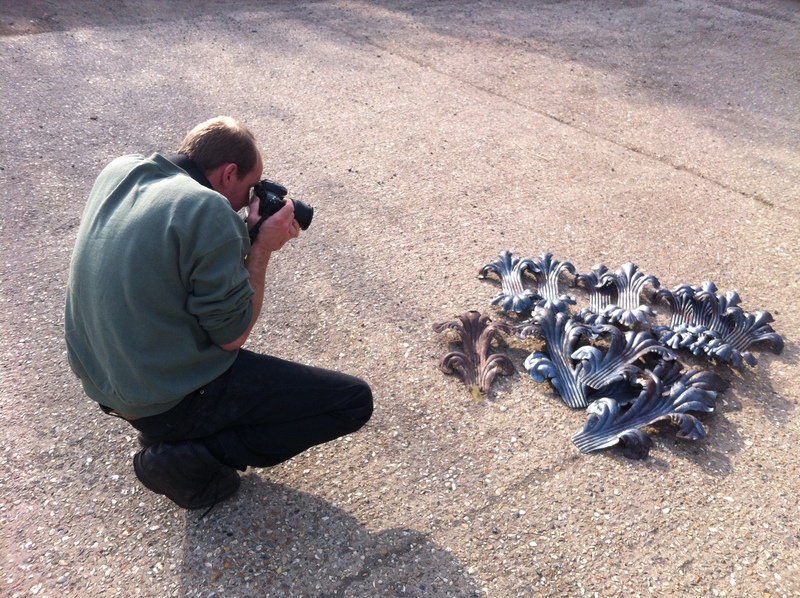 I’d like to have time to reflect on the last months of intensive work, but its not over yet. Gate piers scrolls, leaves and collars. Its so good to see it all come together. 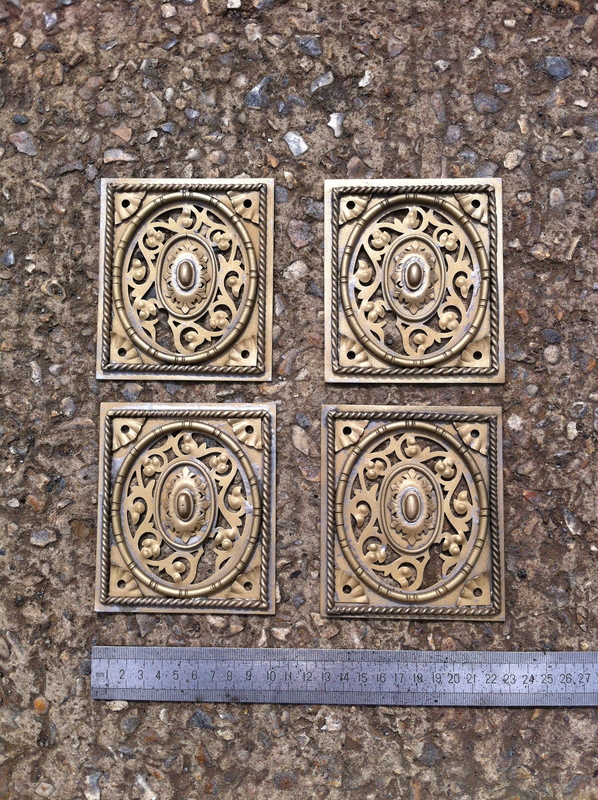 There are times on large projects you begin to wonder if it ever will….. but it always does! 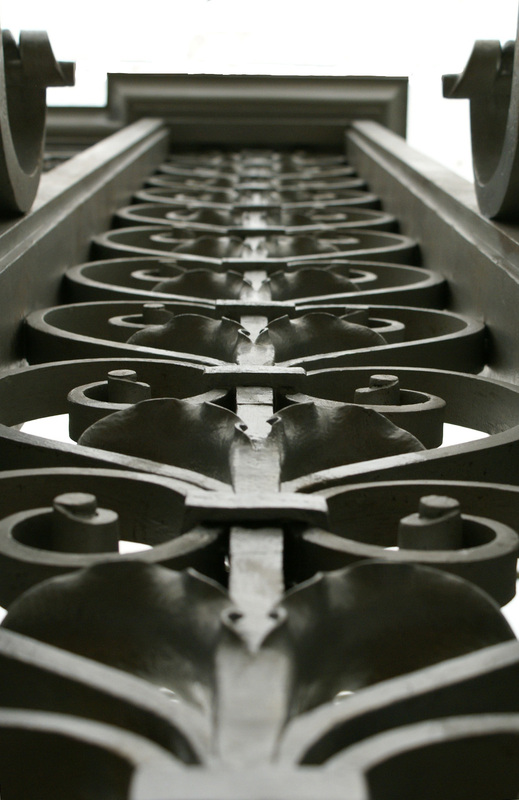 The picture above is looking up at the gate pier scrolls and is an excellent example of the work done by the blacksmiths on this project. nearly all the leaves and most or the collars on this one section alone needed repair or replacement. the close proximity of the symmetrical forms meant that the work was a real test for their reproduction skills, because any less than perfect will be obvious to everyone. 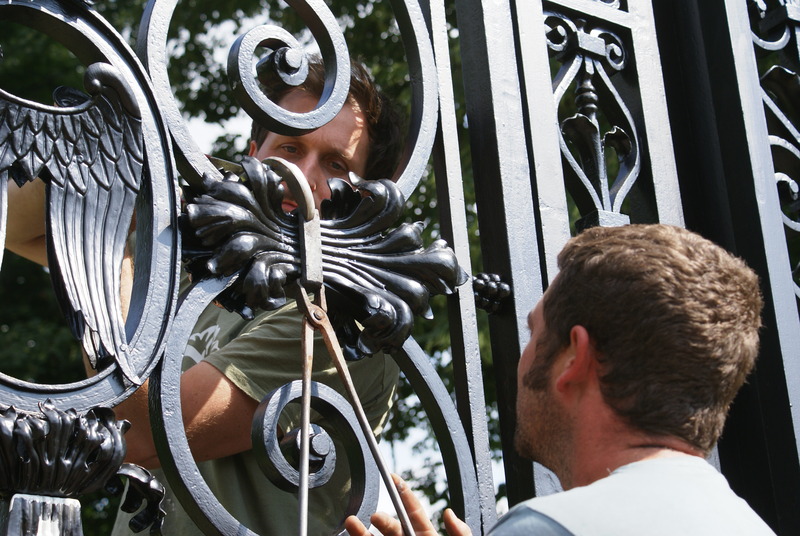 The photo of the gates above is another good example of the importance of getting it right. Many of the leaves were in a terrible state if they were there at all. It is important as I have stated in previous Blogs not to over restore and to hold back replacing components just because they look a bit old or worn. 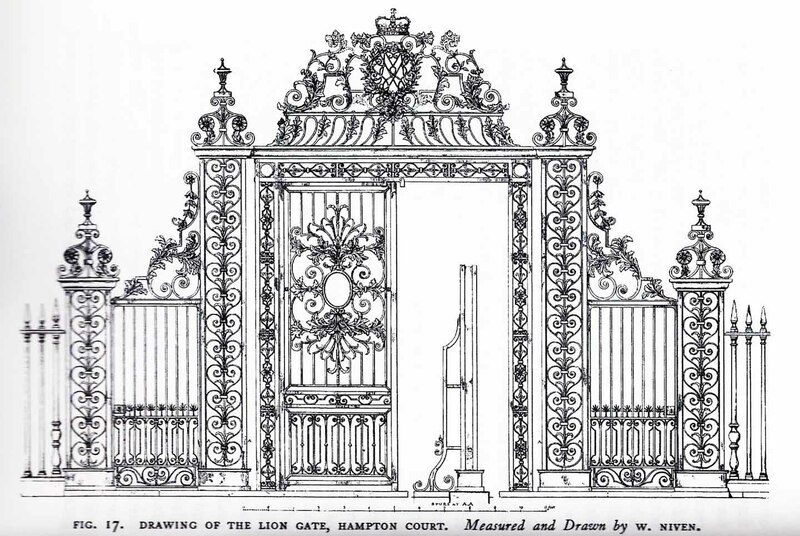 These gates are old and should retain an aged dignity, so it a component is fit for the purpose it was intended for…. it stays! If you look carefully the lowest leaf in the foreground has a corrosion hole in it. 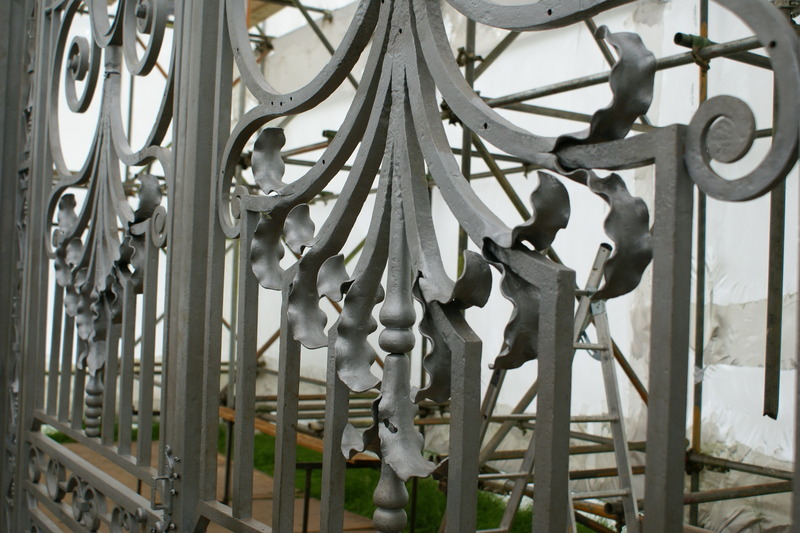 The decision to leave in situ, with no patch repair and only to clean it, was because it was strong enough for service and more importantly it was one of the few originals left on this part of the gate that still maintained its original form. 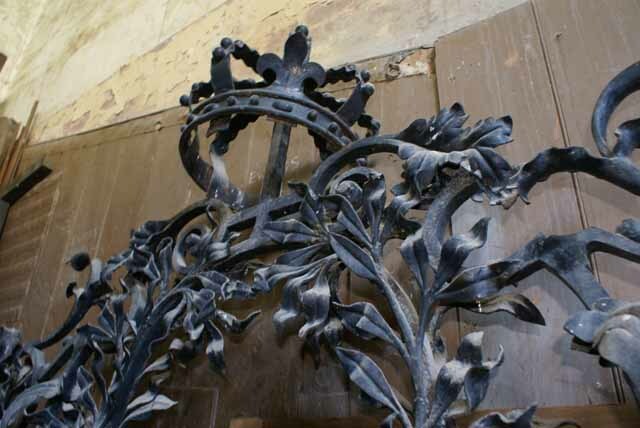 The rest on the leaves you see are for the most part are reproductions or partial repair. In an ideal world you would intend to use all the original material and componets, but thats not always possible. So the philosophy and policy where you retain of at least one original, in-situ component (when possible) is vital for accountable Conservation, even if they are a bit rough. 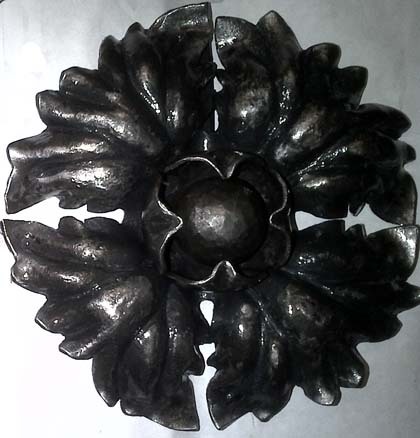 In some situations one leaf or a scroll end can be the indicator of the original craftman’s skill and designers intention.